Available with 3–15 gpm capacities, Portable Filter Carts are suited for new fill or kidney loop filtration of hydraulic and lube oil systems, including gearboxes. Systems remove water via absorptive elements andÂ neutralize acids using Fullers Earth or Activated Alumina cartridges. Particulates are removed via pleated microglass filter elements to achieve counts as low as ISO 14/13/11. Depending on oil temperature, varnish is removed by granular absorbent media cartridges or depth media filters. 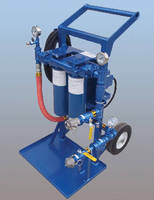 Boerne, TX — Oil Filtration Systems has announced a new line of portable filtration equipment for hydraulic and lube oils. These filter carts can be used for new fill or kidney loop filtration of hydraulic and lube oil systems, including gearboxes. Additional common applications include the purification of EHC fluids (including FYRQUEL® phosphate ester), PAG / PAO and synthetic oils, coolants and water glycols. Other uses include the filtration of diesel fuel and heavy fuel oil (HFO), transformer and compressor oils. These new filter carts can remove four types of contaminants from industrial oils. Particulates are removed by pleated microglass filter elements to achieve particle counts as low as ISO 14/13/11. Water is removed via absorptive elements. Acid can be removed by Fullers Earth or Activated Alumina cartridges to neutralize acids, lowering the TAN (Total Acid Number) and helping to improve oil color. Finally, varnish can be removed by either granular absorbent media cartridges or depth media filters, depending on the oil temperature. Filter carts are an essential tool in many hydraulic and lubrication systems. Because new oil in drums or totes typically does not meet stringent OEM cleanliness specifications, it should be filtered prior to use in hydraulic or lubrication applications. Oil Filtration Systems manufacturers carts and skids with capacities ranging from 3 GPM (680 L/Hour) to 15 GPM (3,400 L/Hour). Low viscosity systems are available for light hydraulic and lube oils, ISO 32 - ISO 100. High viscosity systems with special pump motor packages and filter housings are available for gear oils, ISO 150 – ISO 680. Oil Filtration Systems maintains a rental fleet of filter carts and other oil purification equipment ready for emergency mobilization anywhere in the world. Oil Filtration Systems (OFS) manufactures purification systems for a wide range of industrial oils and fuels. By preventing the unnecessary disposal of millions of gallons of oil and fuels every year, OFS plays a significant role in helping to protect the environment. The company designs and manufacturers an extensive variety of systems to remove contaminants such as water, particulate, entrained gas, and acid from industrial fluids. OFS is located at 111 Parkway Drive, Boerne, Texas 78006. Oil Filtration Systems is a Clark-Reliance Company.